Frank's All Surface Refinishing Is an expert in Shower Refinishing. We can take your old moldy and mildew strewn Shower and turn it into a thing of beauty. After using your Shower every day for years the grout becomes discolored and mold and mildew are everywhere! This becomes unsightly and cleaning is almost impossible. Soap scum and dirt become ingrained in the grout joints and sometimes the only remedy is to tear out the tile and replace it. With Fiberglass Showers, sometimes the fiberglass becomes dull and allows the dirt and soap scum to adhere to it. Frank's All Surface Refinishing can solve this problem within a matter of hours. Our technicians are specifically trained to deal with these problems. We will completely clean your Shower Stall, removing all the dirt, grime and mildew and then Refinish it with a high-gloss white or bone finish. You won't believe the transformation. The coating that we apply is specifically engineered to create a hard surface over your tile and grout. Your Shower will look brand-new. This will enable you to clean your Shower much easier after the Refinishing process. Most people will think you actually replaced all the Shower Tile. 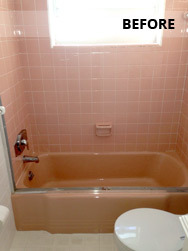 Frank has 20 years experience Refinishing Tile and Fiberglass Shower areas. Take a look at some of the jobs we have done and see for yourself. Then call us for a Free Estimate. 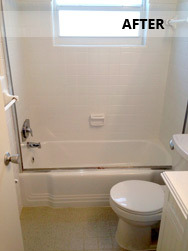 We can change your Bathroom Shower and Bathtub area to a like new condition within the same day.